On "Every Word", some of Mitch Easter's closest friends and collaborators (including Don Dixon, Bill Lloyd, Tommy Womack and Bobby Sutliff) pay tribute to his formidable songwriting prowess. With a resume that includes R.E.M., Love Tractor, Game Theory, Velvet Crush and Pavement, producer and North Carolina native Mitch Easter almost single-handedly helped engineer the college rock explosion of the 1980s, and was the guiding hand behind some of the finest pop-rock of the 1990s. Working from his legendary Drive-In Studio in his parents' garage in Winston-Salem, North Carolina, Easter cemented his place in pop lore, combining a deft ear with a music fan's passion, to craft some of the most timeless records of the early American underground. But for most of the 1980s, Easter was also the driving force behind one of the decade's finest and most commercially under-appreciated combos. Over the course of one EP and three long-players, Let's Active charted a unique course through the pop landscape, effortlessly combining Merseybeat jangle with swirls of psychedelia and unflinching blasts of guitar rock. Now on "Every Word", some of Easter's closest friends and collaborators pay tribute to his formidable songwriting prowess. From The Windbreakers' Bobby Sutliff and Tim Lee to frequent studio partner Don Dixon and Velvet Crush frontman Paul Chastain, songwriters and performers from across the spectrum have gathered to honour Easter's songwriting chops. "Mitch is an amazingly inventive songwriter, able to bring together the diverse elements of perfect pop, psychedelia and hard rock (as well as other genres), without forsaking thoughtful lyrical content," says Lee. "Like a lot of the writers of the eighties, he is vastly underrated because people tend to lump that crowd under the pathetic heading of 'jangle rock'. But to anyone who listens closely, there's a lot more to Mitch's music than can be covered in a two-word stereotype." Sutliff puts it this way: "Mitch has a brilliant, non-linear approach to songwriting that can hardly be compared to anyone else", he says. "His lyrics are deep, yet concise, and his approach to chords and melody can be counted on to take unexpected twists and turns." The project is the brainchild of singer/songwriter and Winston-Salem native Michael Slawter, a lifelong Let's Active fan. Slawter said he decided to take on the project because he wanted Easter to know what a profound influence he'd had on not only his own work, but on the work of others. "Putting this tribute together became much more about honouring a great band," he says. "I got to witness many people - musicians, writers, music lovers, etc. reminisce about what bands like Let's Active meant to them, how life-changing music can be." So, sit back and enjoy, and listen to a heartfelt thank you card from one generation to another: Every Word - a Tribute to Let's Active. 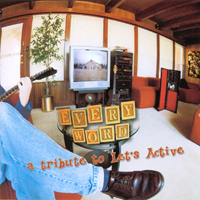 "This new tribute album, 'Every Word: A Tribute To Let's Active' was put together by singer/songwriter and huge Let's Active/Mitch Easter fan, Michael Slawter and it's obvious that this 20 track collection of Let's Active songs was assembled with the love and care these songs deserve. The first thing one notices is the absence of any really 'big' names; no Michael Stipe or even Ken Stringfellow (although Stringfellow does contribute to the sleevenotes). But does this matter? No, not at all. When Bill Lloyd kicks off proceedings with 'Every Word Means No' from the band's 1983 six song 'Afoot' EP it nicely sets the mood for the rest of the album. The song is turned into a typical Bill Lloyd power pop gem; all jangling guitars and harmonies. Then we are treated to Don Dixon and Jamie Hoover's rendition of 'Horizon' from 1998's 'Every Dog Has His Day' album and it's clear that these musicians have put a lot of thought and care into their contributions. With very few exceptions (I can think of only one other tribute album I can say this about) most tribute albums are a hit and miss affair; all they do is make me want to listen to the original but, (dare I say this?) some of these tracks are actually as good as the originals. In some cases the artists have stamped enough of their own identity/sound into the songs that I have no problem listening to them over the Let's Active originals. The Doug Powell track 'Waters Part' where all the sounds are made by the talented Mr. Powell and the ever wonderful Spike Priggen's take on 'Last Chance Town' are two examples of this which spring immediately to mind. There is little point trying to pinpoint one track as a highlight, each and every one would be a standout on whatever album it appeared on. But apart from those already mentioned give a listen to the Trolleyvox version of ' Crows On A Phone Line' or the Crown Scene take on 'Writing The Book Of Last Pages', the latter being the best Beatle sounding song I've heard in a long while, it could almost be Lennon singing and the backwards guitar gets to me every time. The whole package is superb. The inlay book, and it is a book, contains comments from all the contributing artists as well as recording information and short essays from John Micek and Gil Ray(Game Theory) to name but two. The inlay is also littered with comments from Scott Miller, Peter Holsapple and Kimberley Rew. You get the picture. The 'tribute' album has become a bit of a cliché these days. When I started writing this piece, I wanted to make a point berating the fact that tribute albums are growing to be so prolific these days that the very abundance is making the act of homage a hollow, meaningless affair. If you analyse the inspiration behind these tribute's there seems to be two trains of thought - in some cases it is an honest mark of admiration and appreciation, in others quite frankly it seems an excuse to jump on the band wagon. The success will always lie in the integrity of the artist whose is being flattered, and the quality of the readings that are presented. It is a rare gem that makes any sort of indentation on the record buying psyche, and indeed it is becoming hard to see the real point in putting together a collection of covers when they rarely come close to touching, never mind transcending, the quality of the original material. We have had in recent year's tributes to Neil Young, Gram Parsons, Hank Williams, Springsteen, a few for Johnny Cash and Waylon and now at long last the one we have been waiting for...'Every Word - attribute to Let's Active!'...yup! Let's Active were a southern pop band out of North Carolina formed by REM producer Mitch Easter. The band made three albums 'Cypress', 'Big Plans for Everybody'and 'Every Dog Has His Day'. Their music was a lively blend of college rock and new wave-y punk, with an ear for a melody and that touch of the classic Beatles/Beach Boys era pop sound that appealed more largely to the critics than the public. To be fair it is hard to see why this somewhat anonymous pop band from the eighties should be receiving 'the treatment.' However they, like many of the great unknowns, had a very dedicated, devoted following and many of those who were inspired by Easter's band have come together here to provide their own personal mark of respect to his work. So when you accept that this then is hardly likely to be the bandwagon hopping kind of affair you come to see that this is an album borne of affection respect and love for their music and therefore the 'tribute' mantle sits properly on this set. Opening cut "Every Word Means No" performed by Bill Lloyd, is a neatly wrapped pop gem, and lays the pattern for what follows, which are nineteen more jangling guitar pop songs performed with the individual personality of the originals in tact whilst being embroidered by the new arrangements. There are some occasional throw away moments, but there are also some very fine performances or work on display. Doug Powell's reworking of "Water's part" is a particularly strong cut, and one that gets its fair share of replays, here he performs every part himself in one of the solo readings of the year. Spike Priggen turns out a notable "Last Chance Town" utilising the pedal steel of Jon Graboff to fine effect adding just a hint of country rock to the proceedings. Other notable moments are King Fly's funky warped guitar take on "Every Dog Has His Day", Soap Star Joe's Weezerish "I Feel Funny" and my own personal favourites the twangsome surf guitars of Failed Energy Giants' "Blue (Pipe) Line" and Paul Chastain's thoughtful and moody "Flags for Everything".